UPDATE: Maybank rolled out a few changes ever since this blog post was written. One notable change is that transfers into your account now get the sender name information. Hurray for this change, Maybank. For the transfer out of the account, they still haven't added information in the Transaction History, but I'm guessing Maybank deemed it unnecessary since you're the one doing the transfer and you're supposed to take note of the transfers you are doing. A couple of months ago, I was trying to count how many months I have been sending money to my wife and kids another Maybank Savings Account. The problem was it wasn't nearly as easy if you haven't been taking note of it from the get-go, which I wasn't at all. My problem was compounded by the severe lack of information on transfer history from Maybank2U (Maybank's online banking service). I wasn't sure which of the transfers were for the specific bank account I wanted to count. And with the volume of transactions for my account, it wasn't pretty as well. I tried the first obvious choice which is to check my bank statements. Lo and behold the bank statement is as plain and simple as a white piece of paper (exaggeration alert). All the information I was able to get there was the amount of money transferred, date and transaction description. Not wanting to give up, I checked the M2U History in Maybank2u. Partial success though, we can find the information I was needing (to/from which bank account I sent money). So the only thing I can do was to contact the owner of the account and ask him to count how many times I have sent to his account for the past year. Another problem is, if someone sends me money via Maybank2u, there was no indication from whom that money was from. 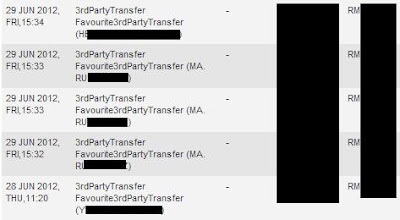 It will only show as "FUND TRANSFER TO A/C" in the statements and won't appear in the M2U History at all (since it wasn't you who did the transaction). Unless whoever was kind enough to send you money puts in your email address and SMS while making the transfer, you'd have no way of knowing. Compared to another online banking service I am using (which has improved a lot by putting in the to/from account for both transfers out of your account and into your account -- they didn't have it before), it seems pretty backward for Maybank2u which if compared with the said online banking service would beat it to a pulp (but not in this specific department though). BPI's Expressonline: Details column contain the (1) Name of the sender and (2) Account number for transfers out of your account. So here comes the fun part: How to keep track of third party transfers in Maybank2u. In an ideal world, Maybank would have changed their system to include the information that I found lacking in Maybank2u. But that won't be easy enough, and who knows when and if they will heed the suggestion. Step 1. Get another email account where you will be sending all the confirmation emails from Maybank2u with regards to transfers. For Gmail accounts, there's no need to get a new email address, use the '+' operator. If your email is: hikingfan@gmail.com you can try setting the email addresses to hikingfan+maybank@gmail.com. More information can be read here. NOTE: Each edit of a third party favorite account will require 1 TAC SMS from Maybank2u. Third party favorites all pointing to 1 email address. Whenever you initiate a transfer, the confirmation email will then be sent to your email address (not the recipient's true email address) -- it will then be up to you if you want to forward the confirmation email to the recipient. And when the time comes you need to audit all your transactions, it will all be in one place: the email account (or alias you created in gmail) that you specifically created for this purpose.